It's time for my long-overdue Vancouver half marathon race recap! 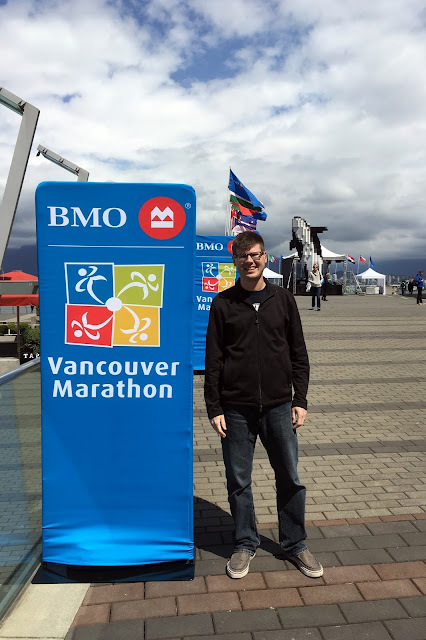 Kevin and I took a trip to Vancouver for the race events on May 1. 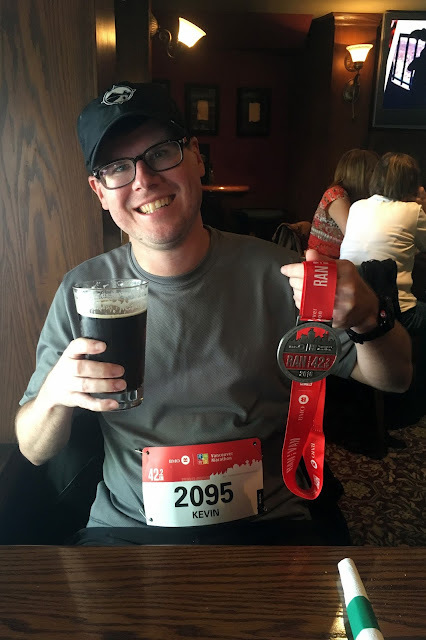 This was Kevin's goal marathon, and I signed up for the half because I thought it'd be a fun way to see more of the city. In hindsight, this was not my best idea; my brain wasn't ready to run a race yet after the 50K. I decided to use it as an easy run and to enjoy it the best I could. We flew to Vancouver on the Thursday before the race, and I loved going in a few days ahead of time. What an amazing city! We enjoyed the time to relax, eat awesome food, and to do a few runs along the water. Kevin felt the runs were helpful because we had happened to run the end of the marathon course, giving him an idea of what was coming. Coastal run after arriving on Thursday. Another coastal view, this one was on the marathon course. We had an amazing brunch at Cafe Medina on Friday, then hit the expo before it was crowded. The expo was great and pretty big, plus the Saucony race apparel was awesome. I don't usually buy the race logo gear from expos, but I did get a cute long sleeve hoodie this time. Packet pick up was quick and easy too. 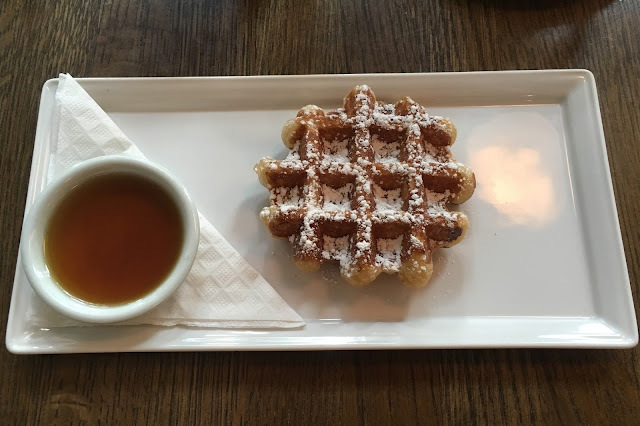 The amazing Cafe Medina waffle with maple syrup. Yum! Kevin with the expo entrance banners. 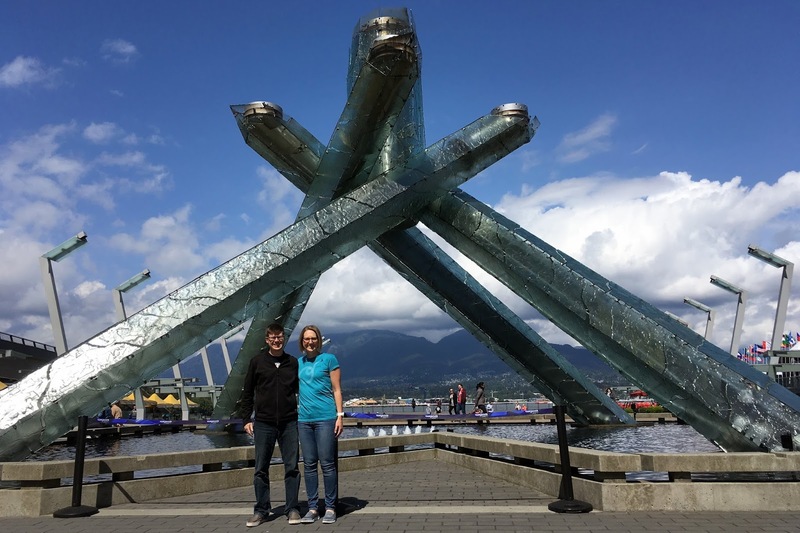 Photo with the Olympic Torch, right outside of the expo venue. 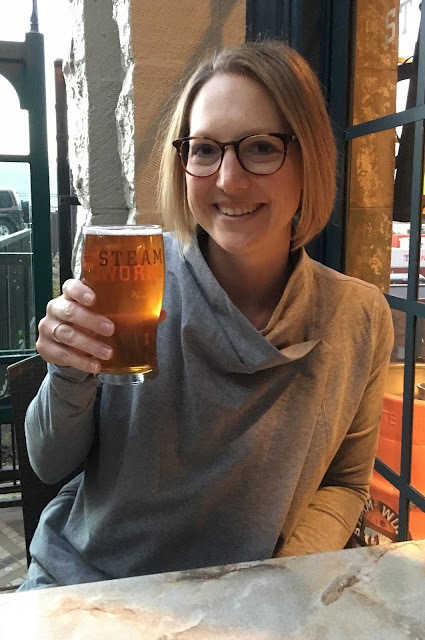 After the expo, I did a little shopping on Robson Street and we went to dinner at Steamworks Brewery in Gastown. Both the food and beer at Steamworks were fantastic! Gastown was cute and picturesque because it had steam lamps and a steam clock. Enjoying our patio seat and beer at Steamworks. 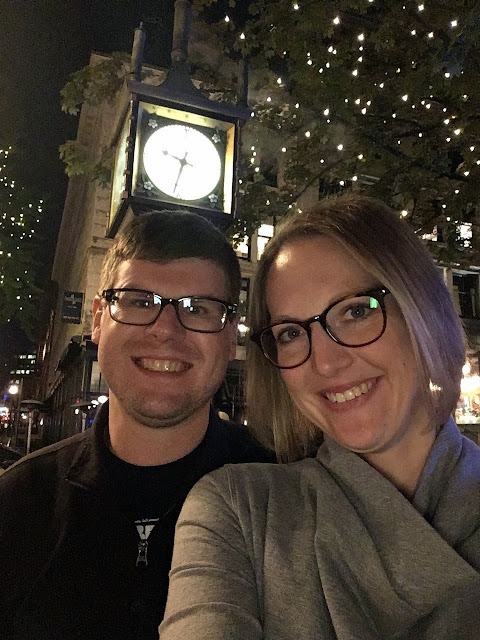 Selfie with the steam clock! On Saturday morning, we did a short shakeout run, walked around the city, had lunch, then spent most of the day resting. We went to a nearby pizza place for dinner and headed to sleep early. Shake out run. This bridge was on the half course. Race morning, we woke up around 5:00 am. The half start time was 7 am, and we needed to get a train around 5:45 am to get to the start area because the course is point-to-point. I was very impressed that the race organizers gave everyone a public transportation card to enable easy transportation to the start. Well done! The marathon didn't start until 8:30 am, but Kevin wanted to be up for a while before his start time and decided to go early with me. The start area was well-organized with plenty of space for everyone and minimal porta-potty wait time. 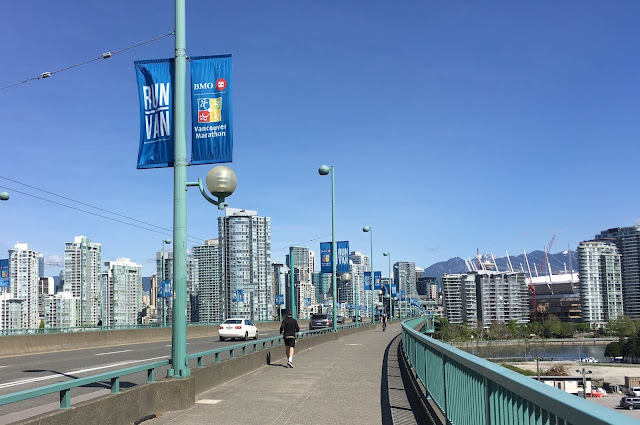 The weather forecast (high in the mid-70s) was hot for Vancouver so they kept warning us about high temperatures and reminding us to hydrate. My California-adapted self felt chilly at the start, but it was easy to keep my sweatshirt right until I went into the corral because Kevin could gear check it with his bag. At 7 am, off we went! After a very slight incline, the half heads across the city and has a lot of downhill for the first few miles. I don't have a lot of thoughts about the half course because there really wasn't anything memorable; it was mainly city streets and generally pretty boring. In the later miles, we went through Stanley Park on a road and it was nice to be in the trees. There were some small hills but everything was very runnable and the climbs were short. However, the half course is very different from the marathon, which does a long perimeter of the city by the water. Kevin loved the marathon course and enjoyed running the footpath by the water for a number of miles. He said the mountain views were spectacular and he felt inspired when he was running. 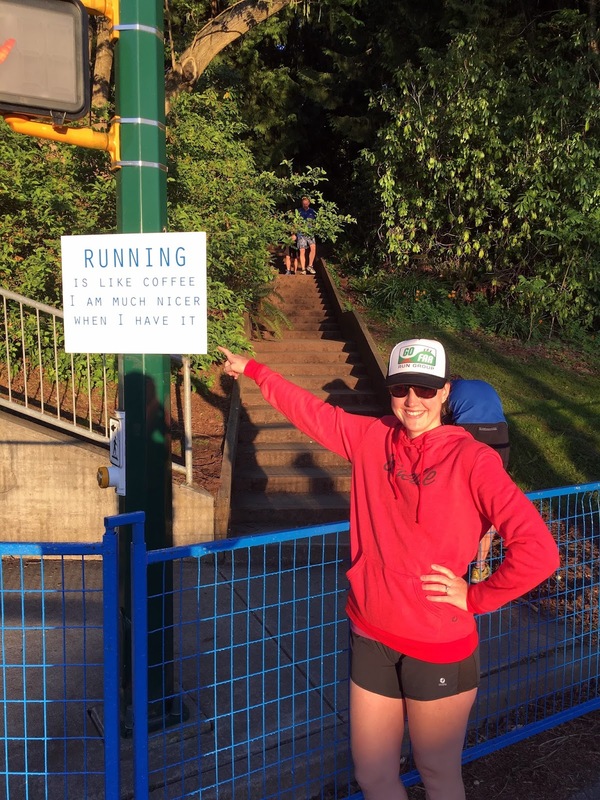 It sounds like the marathon is the event to do here! As far as the running part, my calves were on fire the whole time (probably from running too much road and track in the week before this) and I kept the pace very easy. The course felt like it went on forever and I was kind of bored, but eventually the finish line appeared and I crossed it in 2:13:08. One very notable aspect of this race is the uphill finish; it's a decently long uphill and grade for ending a race. 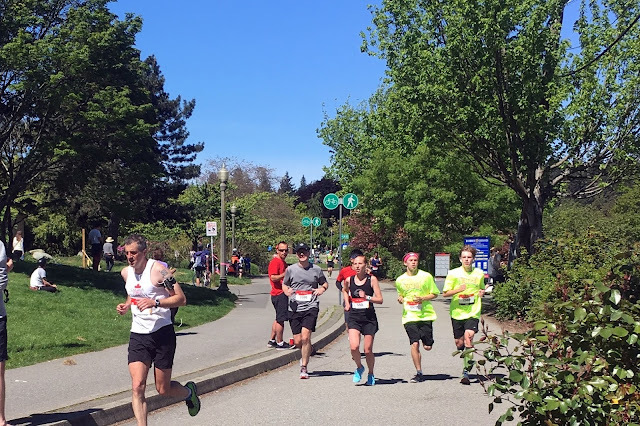 After finishing, I leisurely wandered around the finish area, chatted with some Vancouver natives, grabbed some free coffee from the McDonald's truck, and happily used a foam roller. Eventually I headed to the 1K-to-go mark to spectate. When I saw Kevin coming toward me, I knew he was a few minutes ahead of his PR pace and got super excited! I cheered and then ran back to the finish line to meet him. He had a spectacular race finishing in 3:35, and I'm so proud of him! Kevin (grey shirt) looking strong with 1K to go. Celebratory beer! Would you expect anything else? 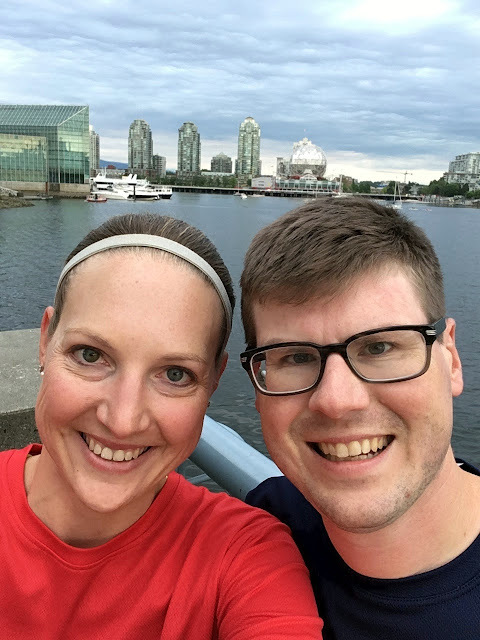 We had a fantastic trip to Vancouver and I know we'll go back at some point - we loved the city! Even though I wasn't personally thrilled withe the half course, the race was super well-organized and had a great expo. Volunteer support was great, gear check was easy (per Kevin), and everyone was very friendly. I also think the terrain would be perfect for a half marathon PR attempt due to the fast downhill start and gentle rolls. Course. 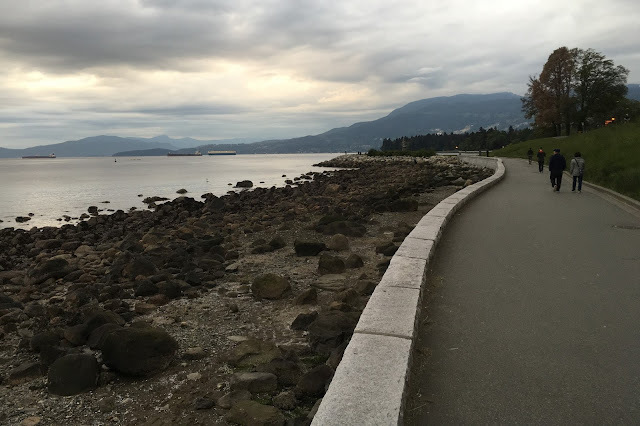 I found the half course to be fairly boring due to running many city streets with no view, but the Stanley Park portion was a little nicer. It feels like a fast course thanks to the downhill start and little rolling hills. The uphill finish could be a challenge during a PR attempt. 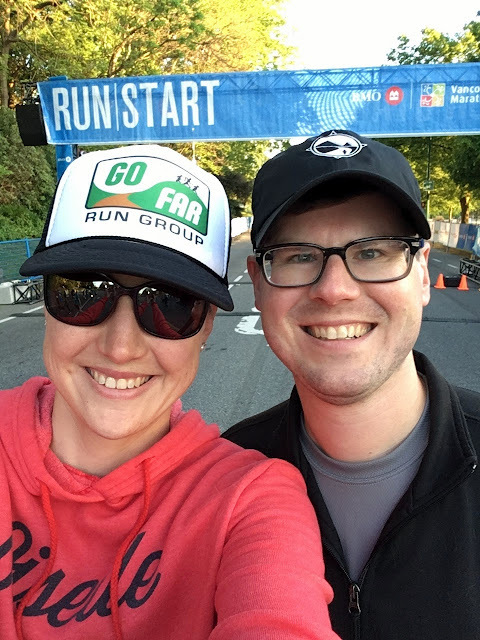 The marathon course spends time along the coast with mountain views, which my husband loved. Support. Volunteer support was good. There were a couple of busy aid stations on the half where I couldn't get to water or had to stop for it, but they were working very hard to try to keep up and I was with a busy section of the half. The race seemed to have a lot of porta-potties along the course as well as frequent medical stations. Finish line. The finish area was fantastic! They offered many different food items at the finish, such as bananas, water, electrolyte drink, and sandwiches. After exiting the finish chute, there was another street filled with fun tents, retail shops, massage, yoga courtesy of Chocolate Milk, places to foam roll, free coffee, and many things I'm sure I missed. I enjoyed hanging out there because I had a lot of time to wait before Kevin would be done. Glad you guys enjoyed Vancouver and congrats to you hubby on the 3:35! Congrats Kevin!! I love Vancouver but I had no idea they had a marathon/half -- perhaps I will have to give it a shot someday!